The Tampa Bay Rays are scheduled to play 14 spring training home games at Charlotte Sports Park in Port Charlotte, beginning on Friday, Feb. 23 against the Pittsburgh Pirates. All home games at Charlotte Sports Park begin at 1:05 p.m. Pitchers and catchers report for the first scheduled workout on Wednesday, Feb. 14. 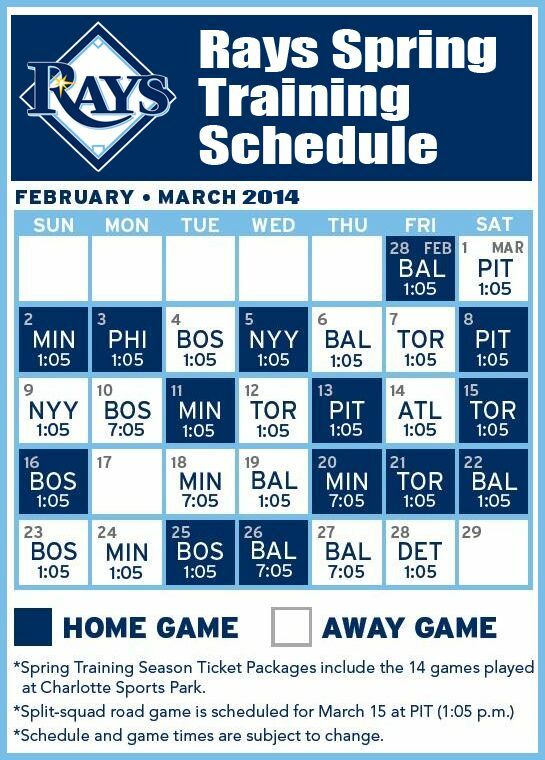 The first full-squad workout is Monday, Feb. 19. If you want to catch the Rays in the Tampa Bay area, here are some dates to consider: the Yankees host the Rays at 1:05 p.m. on March 4 and at 6:35 p.m. on March 19; the Rays visit the Phillies in Clearwater on March 10 and March 13, both 1:05 p.m. starts; the Rays play in Dunedin on March 22 against the Blue Jays; the Rays visit Sarasota to play the Orioles on Feb. 23 (split squad), March 20 (6:05 p.m. start) and March 23 (split squad). The Rays will give away some promotional items during four spring training games in Port Charlotte. A Blake Snell bobblehead will be given to the first 1,000 fans for the first home game at Charlotte Sports Park on Feb. 23 versus the Pirates. A Chris Archer emoji pillow will be the giveaway to the first 500 kids (14 and younger) on March 11 versus the Twins. A Rays alarm clock will be the promotional item for the first 500 kids (14 and younger) on March 18 versus the Tigers. Swim goggles will be given to the first 500 kids (14 and younger) on March 25 versus the Yankees. The spring training schedule will end with an exhibition game against the Detroit Tigers at Tropicana Field on Tuesday, March 27 at 12:35 p.m. Tickets for the Tigers game will be $15 general admission. Parking lots open three hours prior to game time (one hour prior to gates opening). Parking is available in general lots at rates to be determined prior to each spring training season. Accessible parking is available in front of the main ballpark parking lot. Patrons are not permitted to bring food into Charlotte Sports Park, except food needed for medical purposes. One sealed plastic water bottle no larger than one liter per customer, and children’s single-serving juice boxes are permitted. Items not allowed are cans, thermoses, ice chests, glass containers or any other non-collapsible container or object deemed hazardous. Four fixed concessions areas located throughout the ballpark feature a variety of food options. Portable concessions carts featuring an additional variety of specialty food items are also located throughout the ballpark. Credit cards are accepted at the fixed concessions stands. An ATM is located inside the merchandise store. Children 2 years of age and older require a ticket to enter Charlotte Sports Park. The Berm and Baseball Boardwalk are unreserved general admission areas. Chairs are prohibited on grass berms or on the standing-room-only boardwalk deck. Fans are encouraged to walk around the outfield on the 19,000-square-foot Baseball Boardwalk for up-close views of the playing field and bullpens, group seating areas, grill and tiki bar. Animals are not permitted inside Charlotte Sports Park, with the exception of service animals. For seats in the shade, pick the upper rows (200 seating). In 200 Level Seating, shade is typically rows 8 and above on the first base side, and the last three rows (14-16) on the third base side. For seats in the sun, choose seats in any lower section or head to the general admission areas on the grass berms or standing room on the Baseball Boardwalk. Charlotte Sports Park is located on S.R. 776 which offers accessibility from U.S. 41 and I-75. The Tampa Bay Rays are scheduled to play 14 spring training home games at Charlotte Sports Park in Port Charlotte, beginning on Friday, Feb. 23.